Basically reinforcement steel in RC(Reinforced Concrete) structures has two important role. Withstanding the tension and compressionforces which are induced due to the external loading of the structure. While structural analysis is done, we are always finding a magnitude which dipict the intensity of Moment,Shear and Torsion forces. However, these forces are finally changed in to tension and compression forces depending on the way how the structure is being loaded. Usually reinforcement bars(Rebars) are provided to carry the tension force since concrete is poor in tensile strength. While these rebars are subjected to such tensile force, there is always a tendency of slipping relative to the concrete which surounded the rebar. Hence, Inorder to hold the rebar in its intended position,anchorage is always necessary. This mechanical anchorage can be introduced in different ways as follows. when we have enogh space to provide additional length of rebar as a straight or 180 degree beyond the point or at a section where the rebar has no longer structural functionality, we can use this method. Simply providing extra length of rebar as per the calculation. If we don’t have such help from the nature of the structure or enough space which is usually the case for end of structures or where ever threre is any discontinuities in the structures, we will bend the rebars in to 45 or 90 dgree so as to provide the required anchorage strengh and avoide the above mentioned slipping. 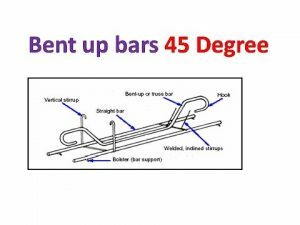 When we come to your question in particular and the reason why stirrups or shear bars are always bended at their end , the following is the reason. Stirrups are provided to withstand shear forces. These forces always induced horizontal and vertical tension force in the structure. For horizontal force we have no problem since there are main bars already provided there even if this is not there intended purpose. But,for the vertical tension force we have to introduce additional bars vertically since concrete is not always enough to carry this force and that is why we are providing stirrups. Meanwhile, these rebars can provide another purpose in addition which is holding the main bar at their right position. Generally speaking , we are bending rebars to avoide slipage of rebars from concrete due to the tensile force induced in the rebar. ← What is sagging moment and hogging moment?